CC Sabathia had yet another rough outing last night. Sabathia surrendered 6 runs as he lasted only 5.1 innings against the Red Sox. This was already the ninth time he has allowed five or more runs in a game. The Yankees were able to get the offense going and win this game, but if their “ace” continues to pitch like this, it will be an uneventful fall in the Bronx. This has easily been the worst season of Sabathia career, as he is pitching nowhere near the level we have become accustomed to seeing. CC has an 11-10 record with a 4.83 era. He is only 1 loss away from tying a career high for loses and there is still a month and a half of the season left to play. Sabathia is on pace to have his career worst numbers across the board. Hiroki Kuroda has become the ace of this staff, no doubt about it. But if the Yankees are going to make any real run a spot in the playoffs, they will need CC to turn things around, and quickly. 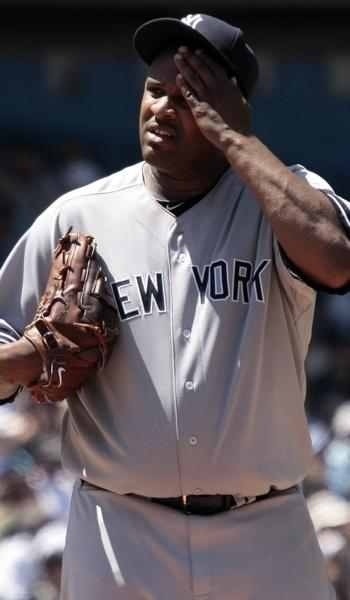 With the struggles of Pettitte and Hughes, they desperately need Sabathia to lock down games for them. The Yankees offense isn’t what it once was, they cannot simply out score every opponent on a regular basis anymore. They may of had a recent power surge but it is pitching that will ultimately make or break this teams season. The biggest concern has to be his drop in velocity. Sabathia has always been a power pitcher, able to reach back and use his fastball to get himself out of jams. This is something that all power pitches go trough at some point in their careers. Except for maybe Nolan Ryan, all pitchers have to learn to make adjustments. It’s not that Sabathia has suddenly become a soft tossing lefty, he’s definitely not that, he just simply can’t reach back and hit 98 on the gun anymore. He will have to learn to pitch around the plate and hit his spots on a more regular basis as his mistakes across the plate are now being hit squarely. The Yankees are hoping Sabathia is able to make these adjustments sooner rather as they have him under contract through the 2016 season. He is owed $71 million over the next three season and also has a vesting option for 2017 that could cost the Yankees another $25 million. Although the Yankees did get 5 fantastic years and a championship out of that left arm, Sabathia’s extension could turn into yet another contract disaster. Can you write an article on Scott Brosius? Why would you want to read an article on SB??? @BigAppleBaseballBlog write something about the game “Running Bases”!!! It’s only a matter of time until he turns it around!